(CNS): Police have arrested 25 people over the last three weeks for drunk driving during the RCIPS’ annual road-safety campaign “Stay Alive”. Another 13 drivers have been arrested for driving whilst disqualified, driving withoutinsurance and driving without being licensed. Since 29 November officers have recorded 135 traffic violations, while 64 people have been fined for using their cell phones behind the wheel. In addition, 45 drivers were ticketed for speeding and 23 people prosecuted for failing to wear seatbelt. Meanwhile, at around 12:40am Monday in Bodden Town a driver managed to overturn his vehicle and ended up at George Town hospital being treated for minor injuries. The annual holiday road safety campaign Stay Alive will continue until 5 January. Anyone who may have information about crime taking place within the Cayman Islands are asked to call any of the police stations or crime stoppers at 800-TIPS(8477). (CNS): A 41-year-old man was arrested early Sunday morning for permitting his premises to be used for the sale of intoxicating liquor. Police raided what they described as premises on Shedden Road in the early hours of 22 December following reports that alcohol was being served illegally. 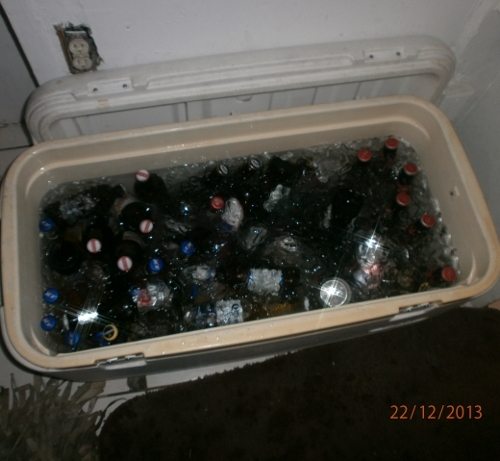 In addition to his arrest two coolers containing liquor were confiscated along with a small quantity of cash. This is the second time in the last few weeks that the police have turned their attention to illegal booze sales as a similar operation was recently conducted off Sparky Drive where alcohol was being sold illegally at a late night session. GT District Commander Chief Inspector Angelique Howell said this latest raid illustrated the RCIPS' commitment to targeting people who are carrying on these types of illegal activities within the Cayman Islands. The senior officer asked for members of the public to report any person or persons whom they know of committing these offences. Anyone who may have information about crime taking place within the Cayman Islands are asked to call any of the police stations or crime stoppers at 800-TIPS(8477). (CNS): Both the premier and the governor were urging people to take time this holiday to think of those that need help in their Christmas messages. Premier Alden McLaughlin said his Christmas wish was that everyone in the Cayman Islands could live year-round with consideration, good will and caring for each other as he urged people to enjoy time with their families and to visit those who are hurting or in need this Christmas season. Governor Helen Kilpatrick asked people to look out for their neighbours who are sick or elderly, and to speak up for children who are at risk. See the Christmas messages below. (CNS): A 53 year old former employee at the Caribbean Club admitted being the man who caused a full scale evacuation of two Seven Mile Beach Resorts when he appeared in court Friday. James Bernie Williams from West Bay who once worked at the Caribbean Club told the court that he was drinking when he made the call to 911 saying there were two bombs about to be detonated at both the Caribbean Club and the Ritz Carlton. Almost a thousand people were evacuated from both of the resorts on Saturday 14 December some of whom were in Cayman for a wedding. Police closed roads and diverted traffic for several hours until they were able to ascertain that there were no bombs at either location. Williams’ case was transmitted to Grand Court where he was bailed to appear in the New Year. As a result of his alcohol problems the court ordered him to stay away from booze as part of his bail conditions and to attend a programme at the hospital he was also barred from going within 50 yards of either the Caribbean Club or Ritz-Carlton.